If You See Something, Say Something. Unless It's About A Fellow American. Molly Huddle’s smudge-less, next-big-thing in U.S. distance running status took a little hit on March 20, at the NYC Half Marathon. With $20,000 for first and $10,000 less for second on the line, Huddle’s left arm—maybe under the influence of the fight-or-flight, primitive sportsmanship-be-damned part of her brain—came up in front of Kenyan Joyce Chepkirui’s chest like a gate, and stayed there just long enough for Huddle to lean across the tape first. By .08 of a second. I think it was an obstruction—a very understandable obstruction, considering the two had covered 13 miles at a withering clip and ratcheted it up from there for the last 150 meters—but an obstruction, nonetheless. So, fine, in the words of investment people, my opinion of Huddle underwent a correction; it was rightsized. Then Huddle went and gave an incredibly indignant response to the mere suggestion that she could have, in the heat of battle, obstructed Chepkirui. Huddle’s arm lingered in its not-today position through several strides rather than swinging in a normal non-obstructing, I’m-pumping-for-all-I’m-worth way. When the commentator says, “I don’t know if I’ve ever seen anything like that,” I thought he was referring to Huddle’s strong arm, and maybe he was, but he caught himself quick. 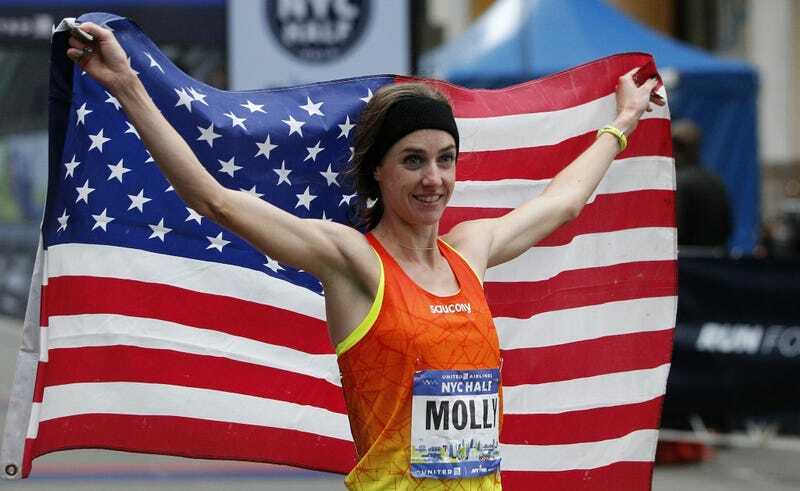 See, this is the US of A, and Molly Huddle is, as I’ve mentioned, a genuine world class talent, a born-and-raised American, thank you Jesus, free from any Alberto Salazar connection or other ethical shade, who can and has taken it to those win-everything Kenyans. And so the announcer caught himself and said, “That was great!” referring, hopefully, to the womano-a-womano battle rather than the arm check. The running forum Letsrun.com’s message board, a gauge of runners’ opinions about the mundane and the meaningful, lit up with similar treasonous stuff, suggesting that, yes, Huddle may have impeded Chepkirui and maybe should have been awarded second place instead of first. Most critics stopped short of saying she intentionally cheated or should have been DQ’d—it was a pretty tame internet mob, as internet mobs go. It was really just that I was focusing on the line, the lean and getting over the tape as was Joyce, who was running up into my backswing. It was an honest finish between two women competing really hard to win a prestigious race. I officially want to say there was no intent on my part to cheat or obstruct Joyce. I would never do that. I’m not a win-at-any-cost athlete and it’s been gnawing at me that that has been the story that has taken on a life of its own from the last few steps. I feel it’s been distracting me from things this week and it was kind of important to voice what happened rather than ignore it because it was a misunderstood incident. Questioning a finish like that isn’t unhealthy or unnecessary. Or a phenomenon. Quite the opposite. That’s one of the most important duties of the media, social or otherwise. One of the great things about the US of A is that we have a free press, so when we see something that doesn’t fit the given narrative, we can question it. Even when it concerns someone as talented and pure and red, white, and blue as Molly Huddle.